Get your online presence started today! Choose your own design and we will customize it just the way you want it! Your design will have its very own mobile and tablet layout that seamlessly displays your content on all devices! Behind your website is the powerful WordPress engine that allows you to edit all your own content, create pages, upload images and lots, lots more! Don't get stuck wondering where to find things - our training videos will help you learn how to edit your website saving you lots of time & money! Want us to write your content for you? This package includes everything in the Blue Package. We will take all your ideas and turn them into flowing pages rich with content and images! We will come to you and discuss what you would like each page to say and how it should feel. Then, we will write your content again and again until it says exactly what you want it to say! Note: For websites containing a large number of pages or lots of content, please contact us to discuss your needs. Want to sell your product through your website? This package includes everything in the Bengal Package. 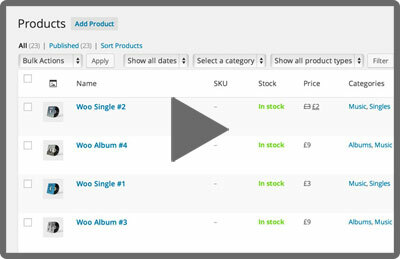 We will setup WooCommerce to look and feel just like your site. The installation of your ecommerce site includes adding products (and helping you write product descriptions & create photos), setup of different payment gateways & shipping options, and customization of account, cart, & checkout pages. We also provide training so that you can continue to add and edit your products when you need to! Note: For websites containing a large number of products, please contact us to discuss your needs. Some shopping cart add-ons are not included in this price. We can help you with your SEO & online marketing for Google Adwords, Facebook, & other social media options. SEO is an on going process that is a bit like tuning an instrument. We can help you optimise your website for your product or brand and then we will continue to fine tune your website until you get the results that you want! Advertise your website on the world's most popular search engine. We will help you target certain search terms in the areas of your market. Google is a cheap option and you only pay for people who visit your site. Studies show that the most powerful form of marketing comes when someone you know and trust recommends a product to you. Utilise the power of your customer's social networks to drive business to your website. There are many other places you can use to help establish your online presence including Google+, Twitter, community hub websites, and blogging. Let us help you drive more customers to your website! Your website will be hosted on our cloud based servers right out of Melbourne. Our servers boast the latest hardware including fast SSD RAID storage that is over 100x faster than SAS or SATA. Receive your first year of hosting free on all websites started before the end of June 2015. Your domain name is an integral part of your online presence. Let us help you choose your domain name that will help you to be identified quickly by your customers. The price for a domain name varies from $10-$25 a year depending on your extension. Blue Tiger Technologies is a family owned and run business operating out of country Victoria. David started developing software many years ago while he was still working in local government. It all began out of necessity when a need arose to produce reports from the ageing financial system. One thing led to another and he eventually left to work on the implementation and development of software for one of the council’s software providers. Now, nearly 20 years later, David is creating web and mobile software along with his son Robert & his daughter-in-law Jessica. Together they develop their own products and work on cutting edge technology for clients in VIC, NSW, QLD, TAS, NT, and WA.